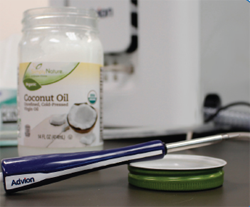 Advion has produced an application note demonstrating how pure coconut oil is tested against a sample of coconut oil adulterated with canola oil for comparative data analysis offering a fast and easy method for purity analysis. The method uses the expressionL compact mass spectrometer (CMS) coupled with the Atmospheric Solids Analysis Probe (ASAP®) to determine and detect adulterants in coconut oils. The demand for coconut oil has taken the ingredients industry by storm. The “miracle” substance is widely used in food, offering health-conscious users a healthy dose of medium-chain triglycerides (MCTs) compared to the long-chain triglycerides (LCT) that are found in most vegetable oils. MCTs are more easily digested, bringing coconut oil to the forefront of the healthy ingredients trend. Coconut oil has also found its way into skin care, hair care, medicinal and industrial products, becoming a key selling point in many items across the globe. However, not all coconut oil is the same. Different methods of processing and the potential for adulteration with lower cost additives comes in to question when dealing with any high-demand, high-value product, therefore, a fast screening for purity is needed. The traditional method for characterizing triglycerides in oils is very time consuming and involves hydrolysis of the triglycerides into fatty acids, followed by LC/ MS. Using to confirm purity of coconut oil. The adulterated coconut oil spectrum was easily differentiated from the pure sample, showing a clear cluste of ions in the m/z 600 mass region. The ASAP method of sampling is ideal for fast detection of adulterated samples. With minimal sample preparation, the ASAP probe for liquids and solids and the expressionL CMS can provide rapid screening for adulteration of ingredients.